Industry Standard Snow Fluid creates a high yield of dense, white, air-born snow ideal for any stage or theatrical setting. Extremely dry flake that floats over long distances yet leaves no mess	Not harmful to plants, skin or eyes. 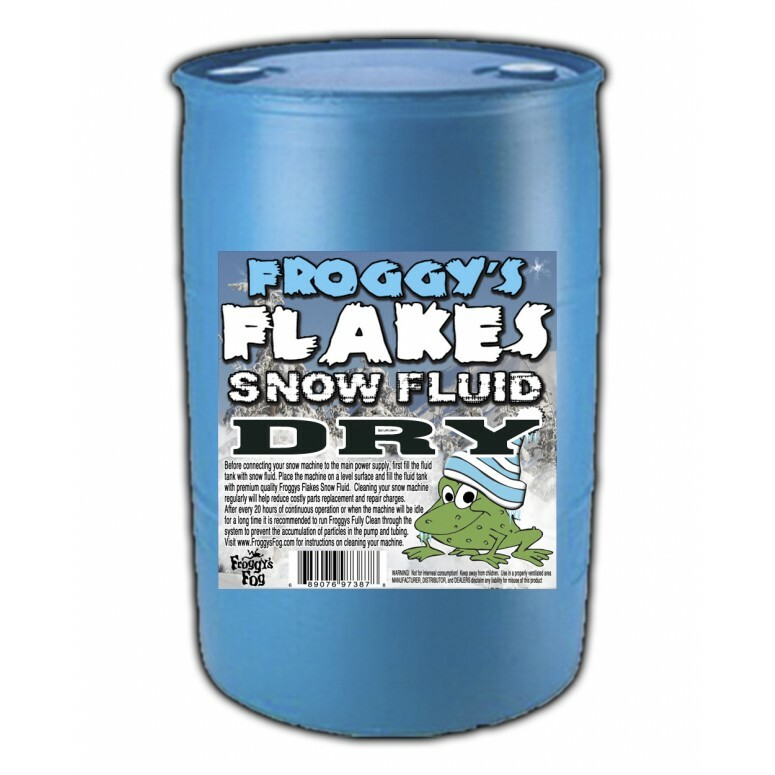 Industry Standard Snow Fluid creates a high yield of dense, white, air-born snow ideal for any stage or theatrical setting. Snow will be economical by virtue of being thicker, whiter and longer lasting. Makes a superior flake. Dry and fluffy! No-slip formula. Not harmful to plants, skin or eyes. Safe for kids. High Quality fluid. An extremely dry flake that floats over long distances. Water content evaporates leaving a beautiful falling flake that is dry when you touch it and disappears after contact. 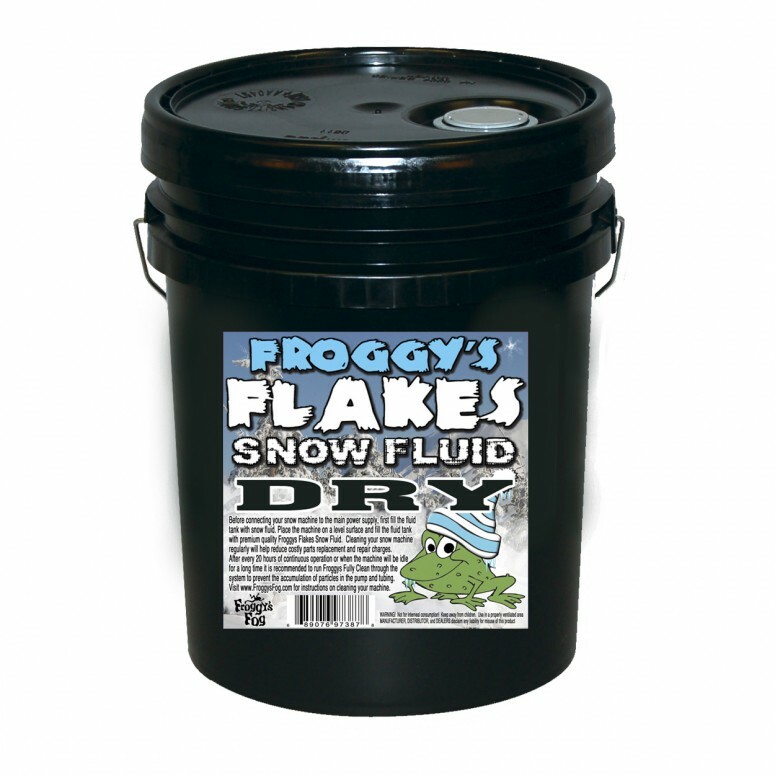 Perfect for use where dry snowflakes are necessary without residue or mess. 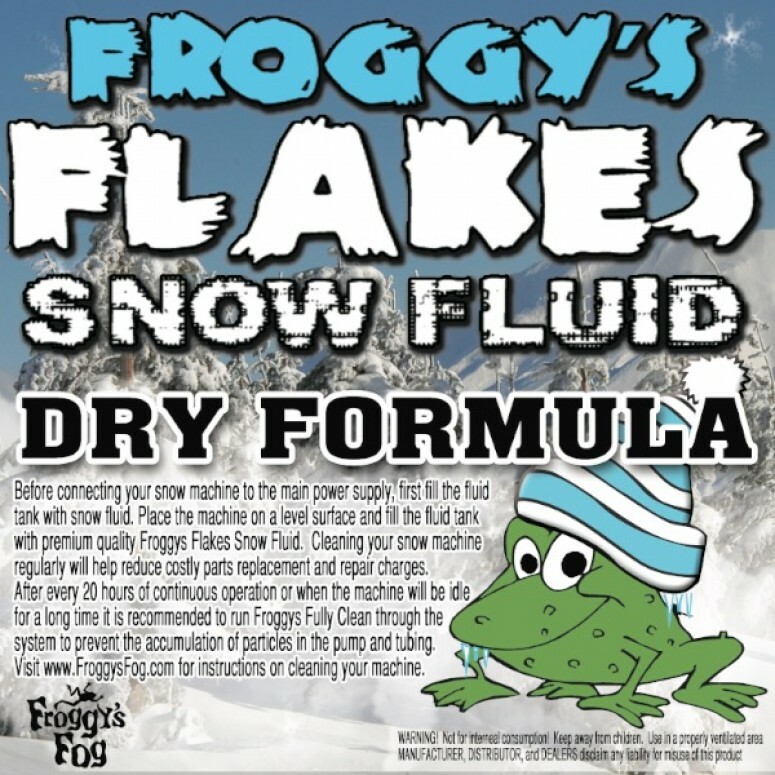 Designed for all professional snow machines as well as small home use machines like the Frosty Flake Snow Machine. Running the machine dry will destroy the pump. Storing it for long periods without cleaning it properly can also do so. If a snow machine turns ""On"", but does not make snow, it is usually the pump that is at fault. An old clogged filter can also limit the ability of the machine to work properly. 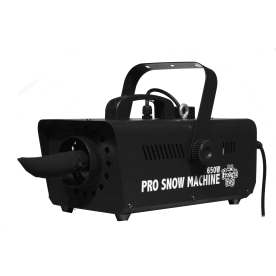 Can you use the snow fluid in a fog machine? Nope, The machines use two different types of fluids. A fog machine heats its specifically designed fluid to the point of vaporization. A snow machine injects air into its room temperature fluid to create small foamy particles, which realistically mimic snow flakes. The two different fluids are not cross compatable and putting snow fluid in your fog machine would likely clog the mechanics of the machine and vaporizing a soap based fluid would produce a weak and terrible smelling fog that you would not want to be exposed to.